Z1023 wants you to see America’s preeminent progressive rock band, KANSAS, at our Warner Theatre November 9! You can buy tickets BEFORE they go on sale to the general public! 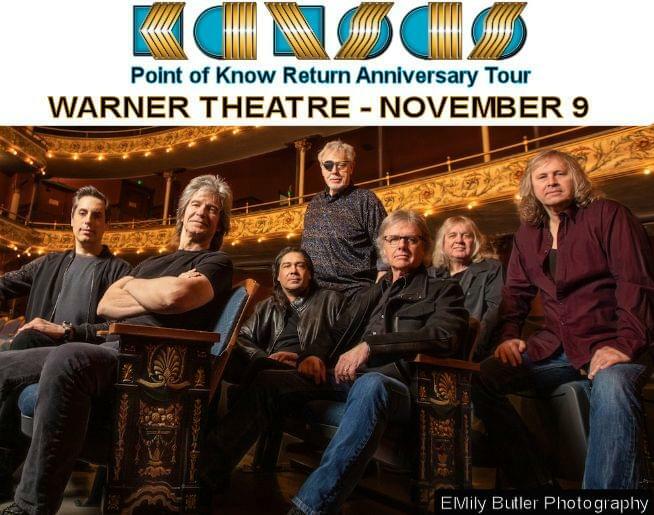 KANSAS will be touring select cities in the United States and Canada in during the fall and winter, on the third leg of their popular Point of Know Return Anniversary Tour. Launched as a celebration of the 40th Anniversary of the massive hit album Point of Know Return, the band will be performing the album in its entirety. The tour showcases more than two hours of classic KANSAS music including hit songs, deep cuts, and fan favorites. information can be found at www.kansasband.com. In 1977, KANSAS followed up the success of Leftoverture by releasing the album Point of Know Return. greatest selling studio album. The album peaked at #4 on Billboard’s Album charts, reached sextupleplatinum status with more than six million copies sold, and had three Billboard Hot 100 singles. Rizvi, and original guitarist Richard Williams. Originally formed in 1973 in Topeka, KS, the band’s documentary film KANSAS: Miracles Out of Nowhere is currently being broadcast on AXSTV. KANSAS has released 15 studio albums, including its most recent release The Prelude Implicit (2016), and plans to release of another new studio album in 2020.